The role of forest ecosystems as carbon sinks is the subject of targeted research in southeast Mexico. MEXICO CITY, Jul 16 2013 (IPS) - Jungles, forests, mangroves, swamps and lagoons are natural carbon storehouses or “sinks” in the Caribbean regions of Mexico. But now studies are being conducted to measure their capacity for absorbing carbon dioxide from the atmosphere. These ecosystems are typically found along the strip of coastline that includes the southeastern states of Veracruz, Tabasco, Yucatán, Campeche and Quintana Roo. “The recommendation to avoid deforestation and forest degradation is a measure aimed at the mitigation (reduction) of the roughly 20 percent of greenhouse gas emissions resulting from these causes,” said researcher José Andrade of the Yucatan Centre for Scientific Research (CICY), a government institute. However, “at the same time, emissions from industry and transportation need to be reduced with alternative energy sources. (Forest conservation) alone is not a solution for reducing global emissions,” he told Tierramérica*. As part of the research study “Las hojas: parte fundamental del almacenamiento de carbono en una selva de Yucatán” (Leaves: A fundamental part of carbon storage in a Yucatán rainforest), Andrade and four of his colleagues assessed factors such as air currents, biomass and carbon fluxes in the ecosystem of the Kiuic Reserve, which covers 1,800 hectares in the state of Yucatán. Of the plant species studied, gumbo-limbo or copperwood (Bursera simaruba) trees were found to absorb 730 grams of carbon dioxide (CO2) per square metre, Florida fishpoison or Jamaican dogwood (Piscidia piscipula), 680 grams, and kitinché (Caesalpinia gaumeri), 1.32 kilograms. The last two are native to Mexico. “The data suggest that the species of the area use water efficiently to promote the regeneration of new leaves, which allows them to continue absorbing CO2 and thus to store carbon in the form of biomass,” explained Andrade. The Mexican Caribbean is exposed to increasingly destructive hurricanes and storms and the threat of rising sea levels, which would flood wide strips of the coastline, specialists warn. The area’s biological wealth is also endangered by the expansion of the tourist industry, deforestation, cattle grazing and oil industry activities. Mexico’s emissions of CO2, one of the greenhouse gases that contribute to global warming, total some 748 million tons annually. Agriculture is responsible for 12.3 percent of these emissions, industry for 8.2 percent, and changes in land use and forestry for 5.3 percent, according to the Ministry of Environment and Natural Resources. “Climate change heightens our uncertainty about the future of forests. We aren’t sure about what is going to happen,” Richard Birdsey of the U.S. Forest Service, an agency of the U.S. Department of Agriculture, told Tierramérica*. “In some places forests are growing more, in others they are growing less. This is influenced by many factors that we need to study,” added Birdsey, a member of CarboNA, a joint government-level initiative between Canada, the United States and Mexico for carbon cycle research throughout North America. CarbonNA projects, including one being undertaken in Yucatán, are aimed at CO2 monitoring and modelling in the region through remote sensing and mapping. “It’s difficult to calculate the CO2 in the soil, but we are trying to measure it. We process ecosystems on a small scale to generate emission factor curves,” said Birdsey. In 2011, a group of scientists created the MexFlux network in Mexico, to study water and carbon fluxes based on the same methodology as the AmeriFlux network in the United States. At least seven sites have been established in Mexico to study these mass and energy exchanges between the land and atmosphere. The ecosystems of the Mexican Caribbean provide valuable services for the environmental equilibrium of the region and serve as protection against climate and weather phenomena such as droughts, storms, storm surges and flooding. But the Yucatán peninsula “is highly degraded. There is a great deal of pressure on the ecosystems. The areas that act as carbon sinks need to be analysed. Tropical rainforests fix more carbon dioxide than they release,” Rodrigo Valle, a postgraduate student and researcher at CICY, told Tierramérica. Valle and two colleagues are working on the study “Estimación de la distribución espacial de la biomasa forestal en la Península de Yucatán, usando percepción remota y datos de campo” (Estimation of the spatial distribution of forest biomass in the Yucatán Peninsula using remote sensing and field data). Their research found 229,000 tons of biomass per hectare in the area studied, by measuring the electromagnetic radiation reflected by green matter. Using data from the 2009-2013 National Forests and Soils Inventory, two government agencies, the National Forests Commission and the Mexican Carbon Program, estimated that there are 9.146 million tons of carbon stored in Mexico’s soils. The Yucatán peninsula is the region with the highest levels of buried CO2, due to its chalky soil. This year, greenhouse gas concentrations in the atmosphere reached 400 parts per million, which is considered a critical level for the effect it will have global temperatures. It also demonstrates that the measures adopted up until now are not working, and that the only solution is to drastically cut emissions of these gases. 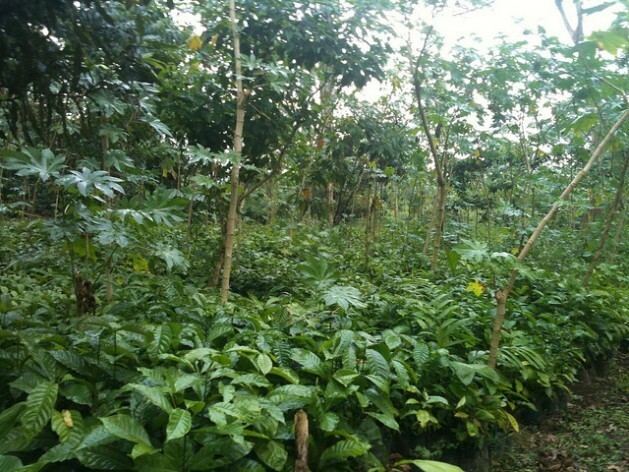 Given the amount of carbon dioxide stored in plants, “one alternative is to reduce deforestation and promote the management and conservation of jungles and forests as carbon reservoirs,” Luisa Cámara of the public Juárez Autonomous University of Tabasco told Tierramérica. Cámara is heading up a study in Huimanguillo, Tabasco to measure the carbon stored in a tropical lowland forest of Quercus oleoides, a type of oak, and plantations of Eucaliptus urophylla, a species of eucalyptus, and Gmelina arborea, a fast-growing deciduous tree, neither of which is native to Mexico. In the areas studied, Cámara and her research team measured 14.75 tons of CO2 per hectare in the eucalyptus trees, 15.54 tons in the Gmelina arborea and 63.51 tons in the oaks. These figures indicate that the creation of industrial tree plantations does not represent a solution for capturing CO2 from the atmosphere. This is so much BS it’s difficult to read.